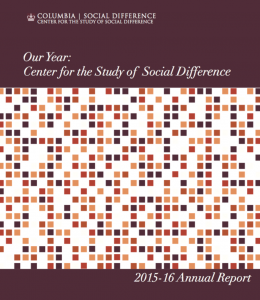 The Center for the Study of Social Difference recently released its annual report for 2015-16. The report announced the successful conclusion of The Future of Disabilities Studies project, The Digital Black Atlantic project, and Women Mobilizing Memory. Four new projects—Precision Medicine: Ethics, Culture, and Politics; Unpayable Debt: Capital, Violence, and the New Global Economy; Religion and the Global Framing of Gender Violence; and Reframing Gendered Violence—were established. The report announces that projects secured funds from the Luce Foundation, the National Science Foundation, the Columbia University Humanities Initiative, and the Columbia Center for Science and Society.